I feel like we've been prepping for this party for months now. 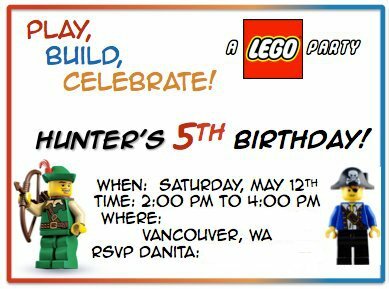 I knew I wanted to make it special for Hunter. 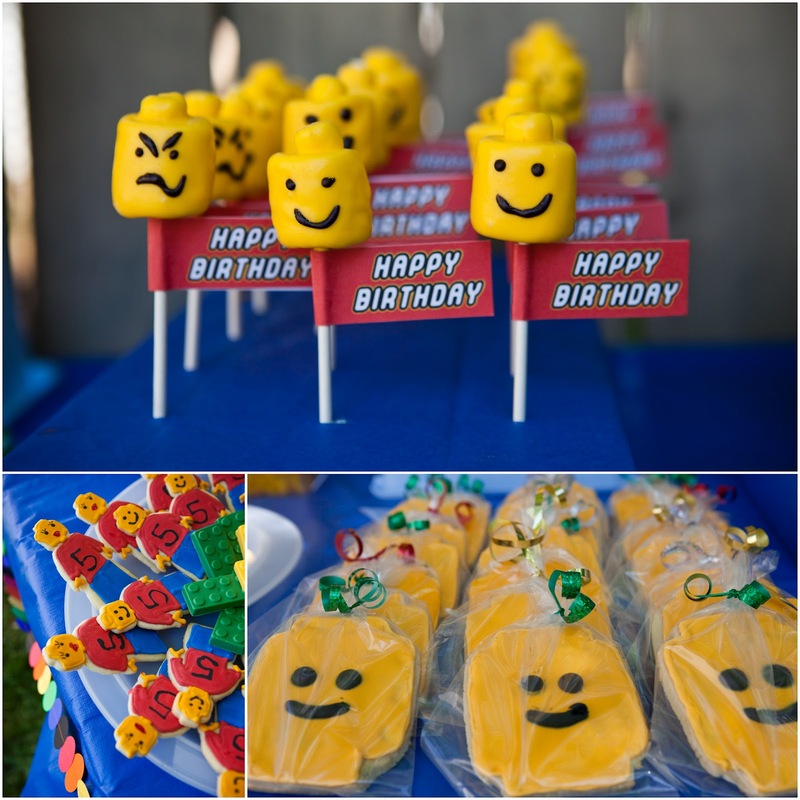 My birthday always fell right around Halloween, and while I don't remember much about the presents and gifts, I do remember my parents always invited a ton of friends over and made the party incredibly special. 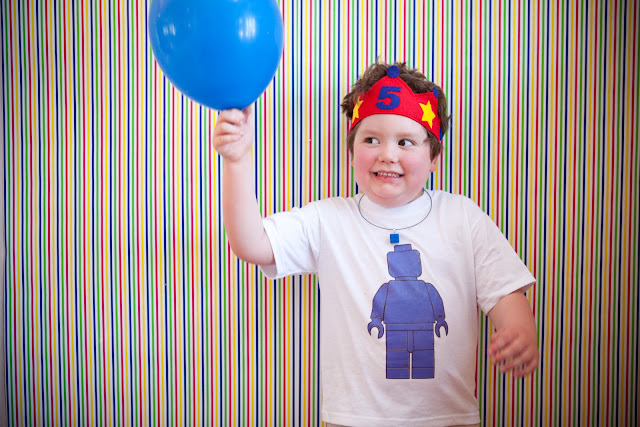 I wanted that so much for my own son, especially now, knowing that he's just at that age where he's going to start having memories of his childhood. With so much going on the day of the party I figured I wouldn't have much time to snap photos, so I enlisted the help of my friend and photographer, Amy Wilbanks to document the day. She did such a stunning job capturing the little details and amazing fun we had. 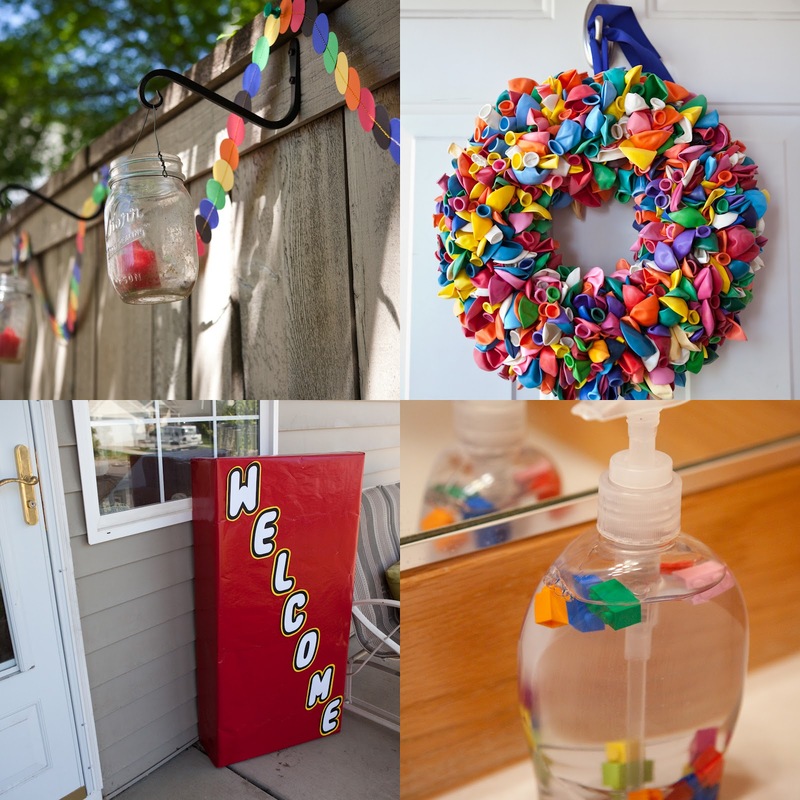 I scoured the web and Pinterest for inspiration. 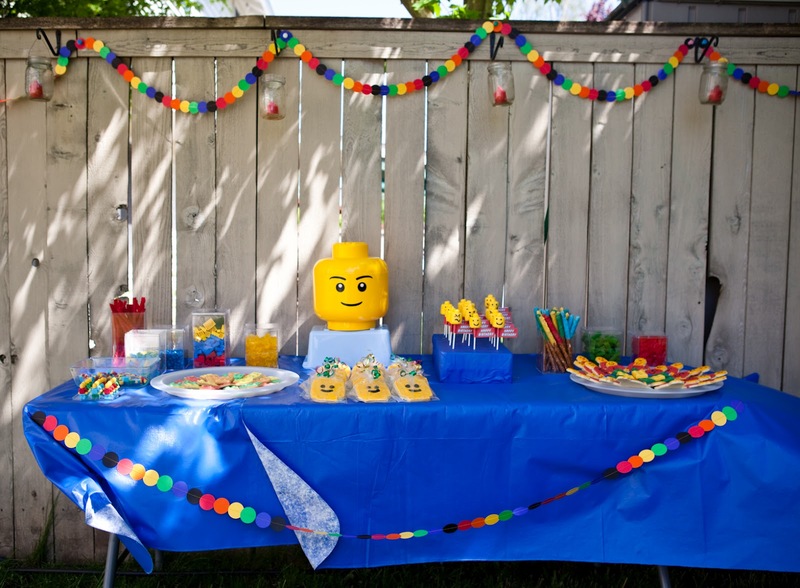 There are so many great Lego birthday party ideas out there. I borrowed from some of my favorite parties and just ran with the rest. Our dessert table was so much fun to put together. 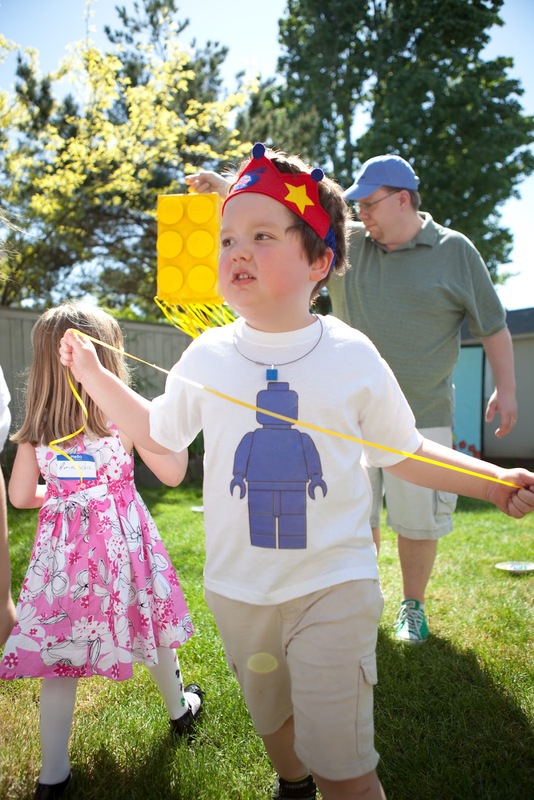 The weather has been gorgeous here in the Pacific Northwest for several days straight, so rather than keep all the kids couped up inside, (which was the plan if it rained) we held the party both indoors and out. It was a last minute decision to move the dessert table outside, but it really opened up space in our house for the kids to play and move around freely - even if it was a bit windy at times outside. 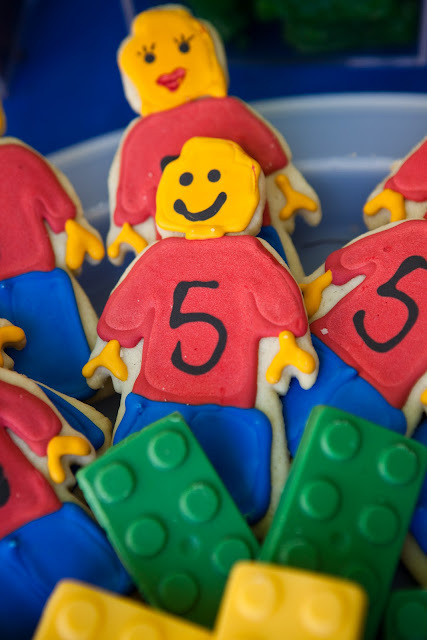 The sweet Lego brick cookies were sent by my friend, Anna. 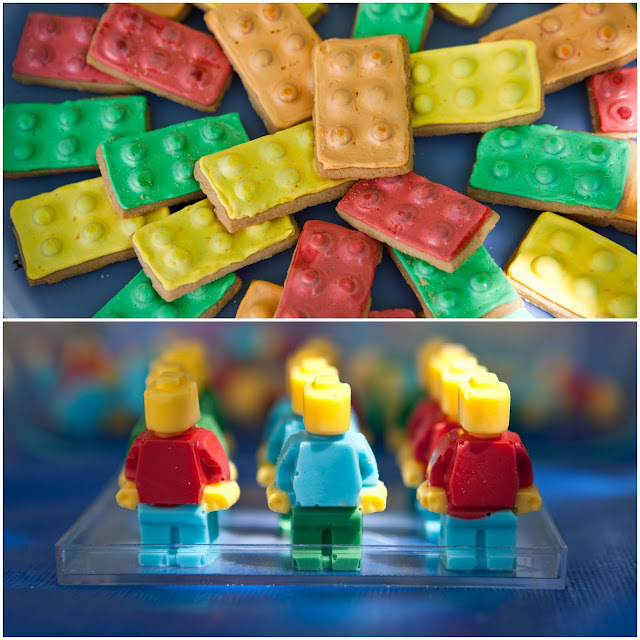 The edible minifigs I made using Wilton candy melts and a Lego minifig silicon mold. 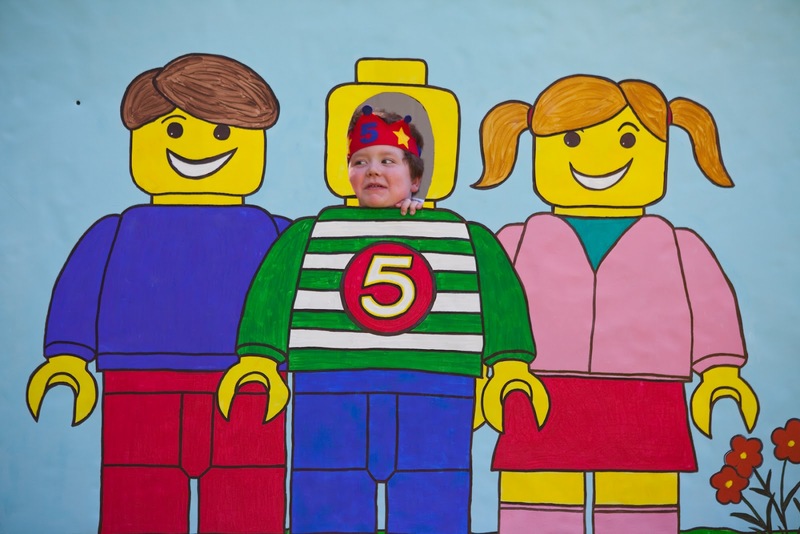 I created Lego straw toppers using some free Lego head clip art I found online (Just type in "free Lego clip art" in Google.) We filled square acrylic containers up with various Lego colored candies as part of the buffet. The Lego brick candy can be found on Amazon. 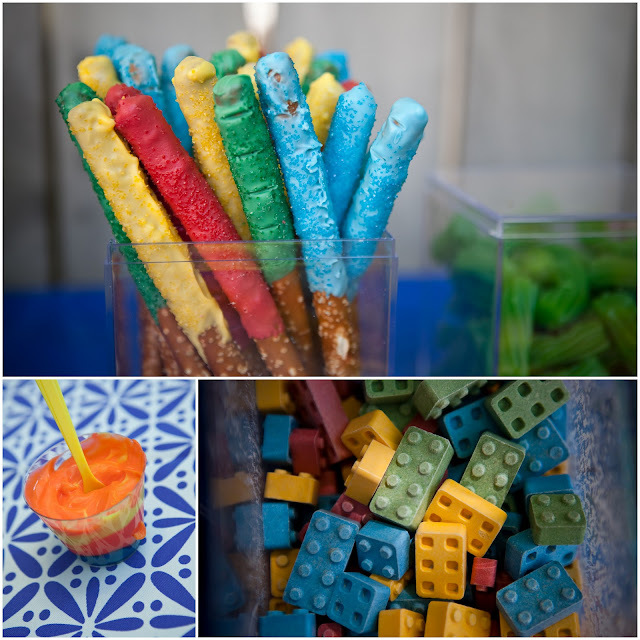 We layered pudding in the classic yellow, red, and blue Lego colors - although in the above picture it's been mixed a bit after one of the kids was eating it. 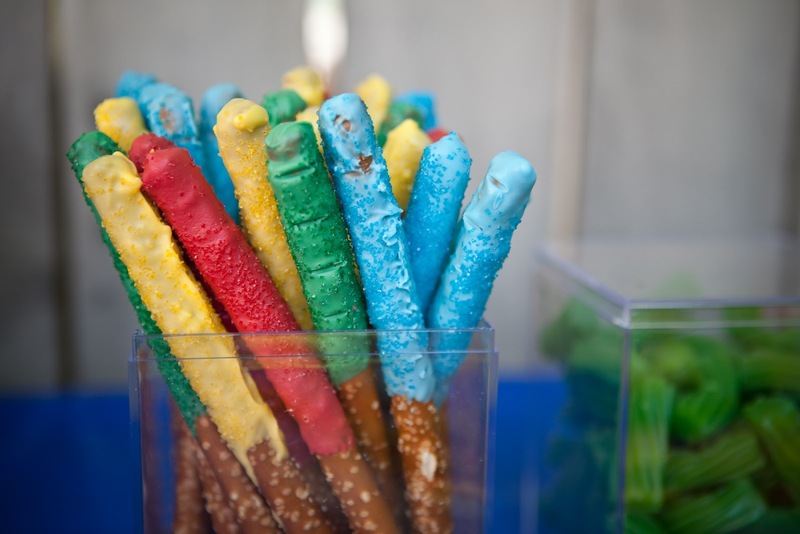 I dipped giant pretzel sticks in more Wilton candy melts and sprinkled them with coordinating colored sugar - they were also placed in the square acrylic containers. Our water bottle labels were handmade. I cut 2 inch strips of bright card stock and placed a hand made sticker (Avery round lables) dead center. I sealed it to the water bottles using clear packing tape. Here's a good water bottle label tutorial. Most of our decorations were handmade. 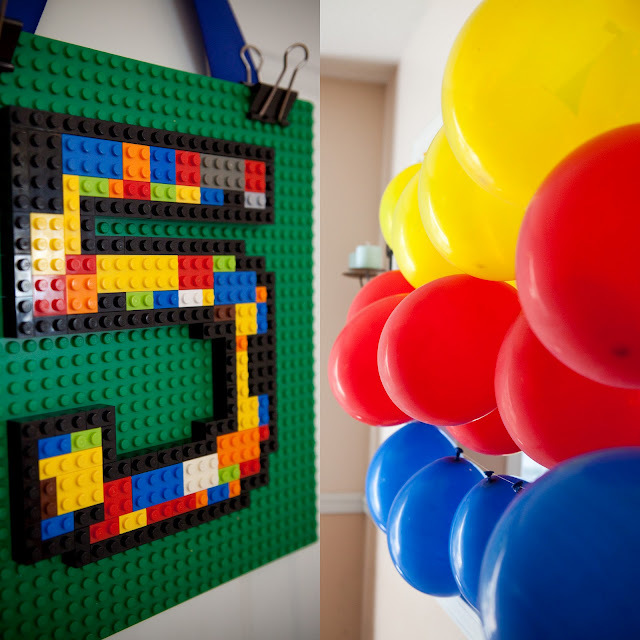 From the giant Lego artwork created using old canvases, empty satin ribbon spools, craft paper, puffy alphabet letters and spray paint, to the paper garland from Hoop Da Loop on Etsy and my friend Lavina. 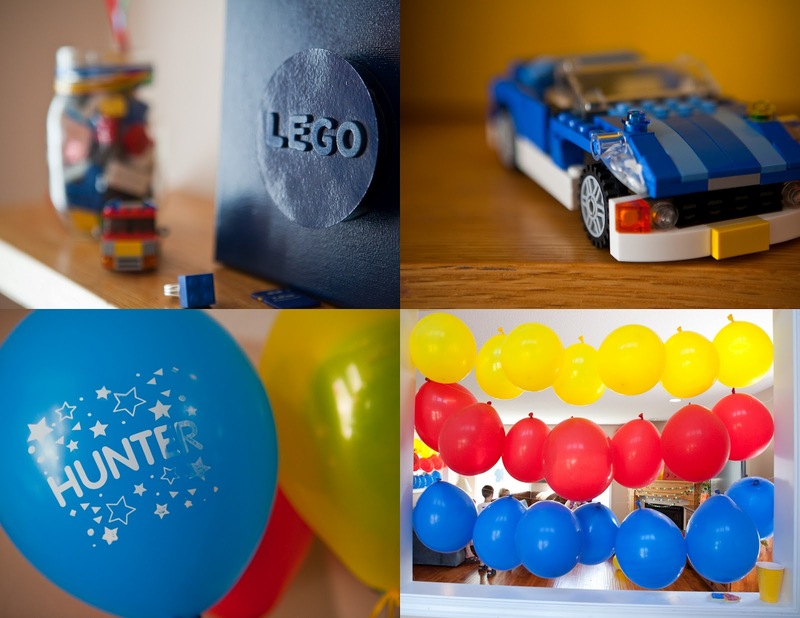 Our home looked like a Craft Warehouse and Lego factory exploded in it for several weeks prior to the party. 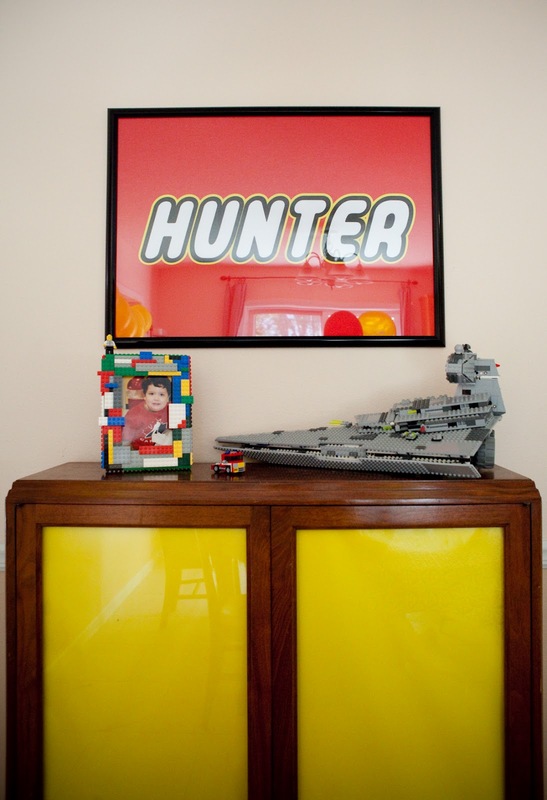 This great poster with Hunter's name came from Anders Ruff. Once the kids all arrived it was time to get down to some serious party fun. 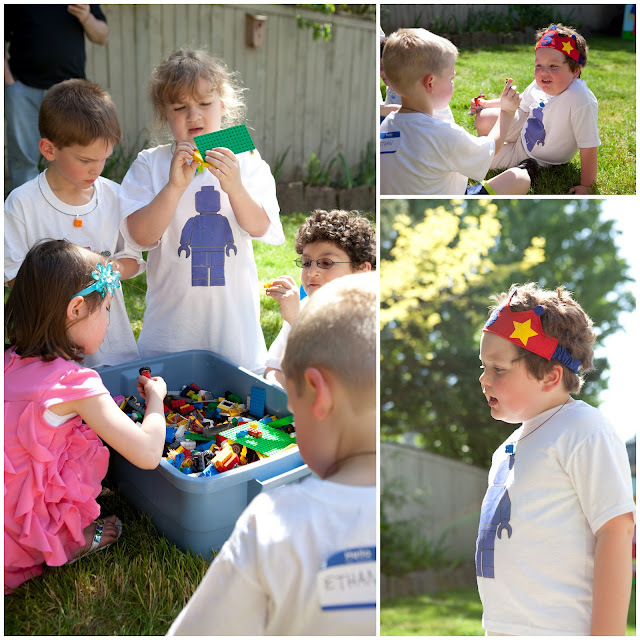 They all received Lego minfig t-shirts I created using iron on transfer paper. A few of the little girls opted not to wear their t-shirt during the party in lieu of their cute party dresses. Who could blame them? 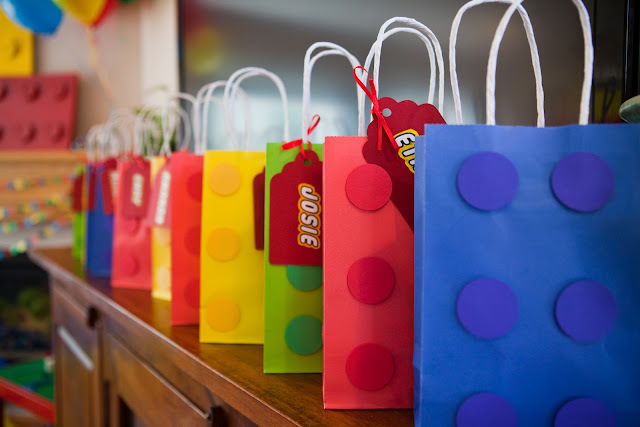 I made goody bags to look like Lego bricks and printed out each child's name in a free Lego font I found online, coloring around their name in yellow to give it the classic Lego appearance. 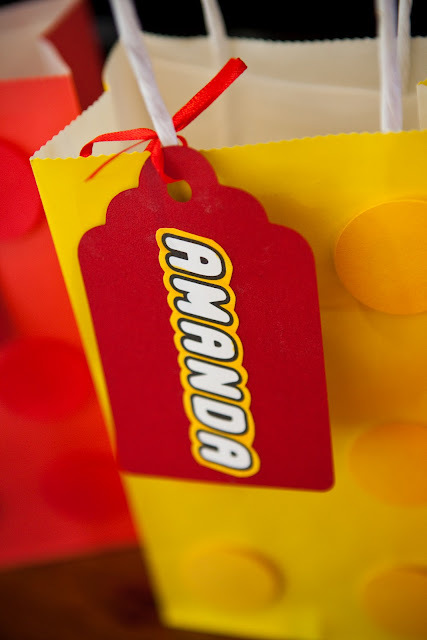 Inside each gift bag I placed some Lego crayons, stickers and handmade Lego rings and necklaces for each child to wear. 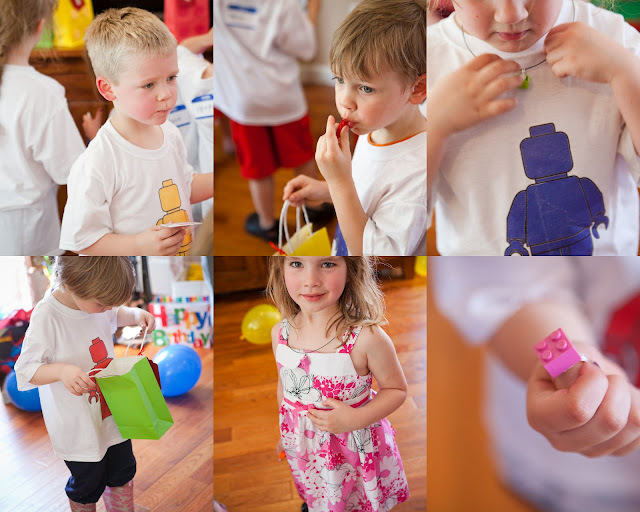 Party bags securely in little hands, it was time to get down to the business of partying. We took the kids outside for photos in the Lego Minifig Place-Your-Face cardboard cutout I created. 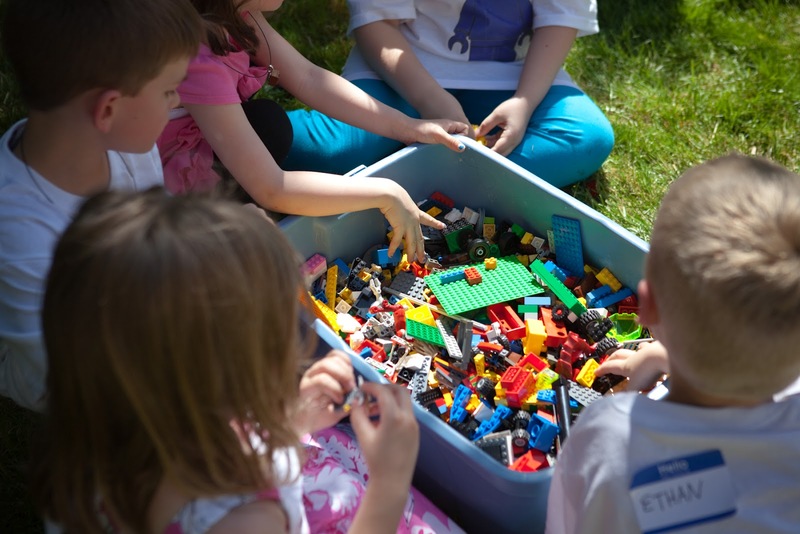 This was a huge hit for parents and kids alike. 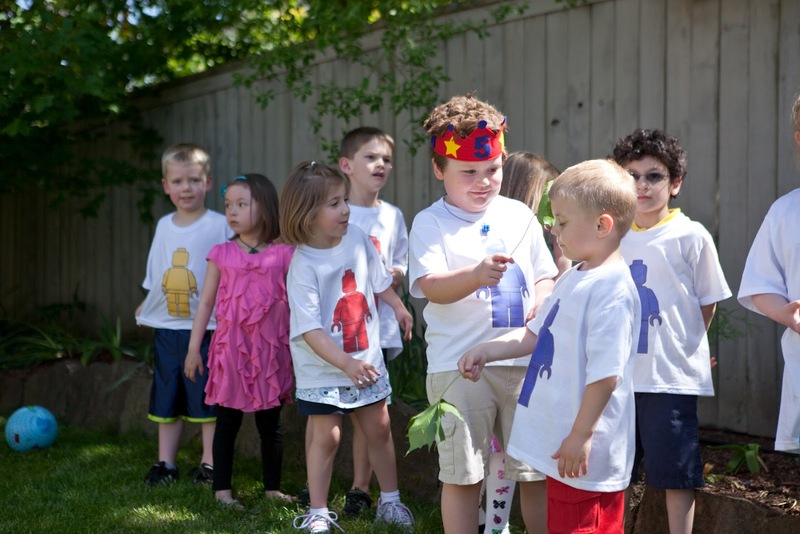 They all lined up to wait patiently for their turn to be photographed. 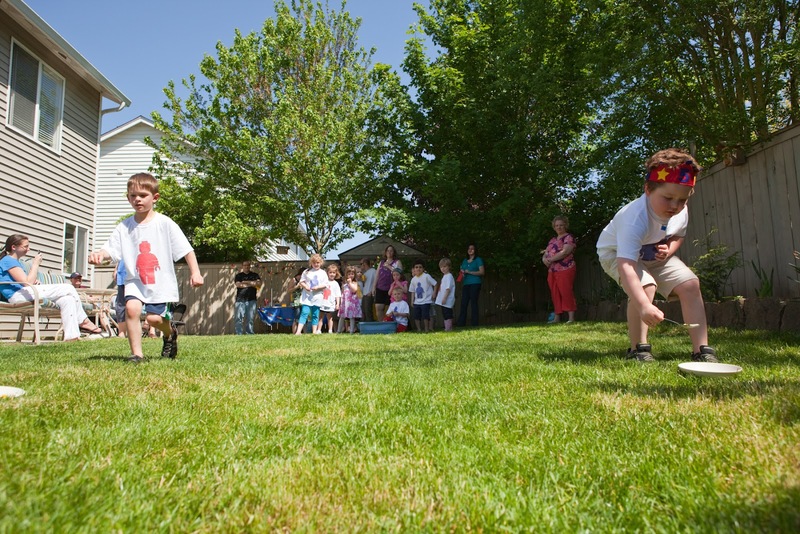 We attempted a relay race where two teams split up and ran a Lego atop a spoon down the length of the yard and placed it into a bowl on the other side. 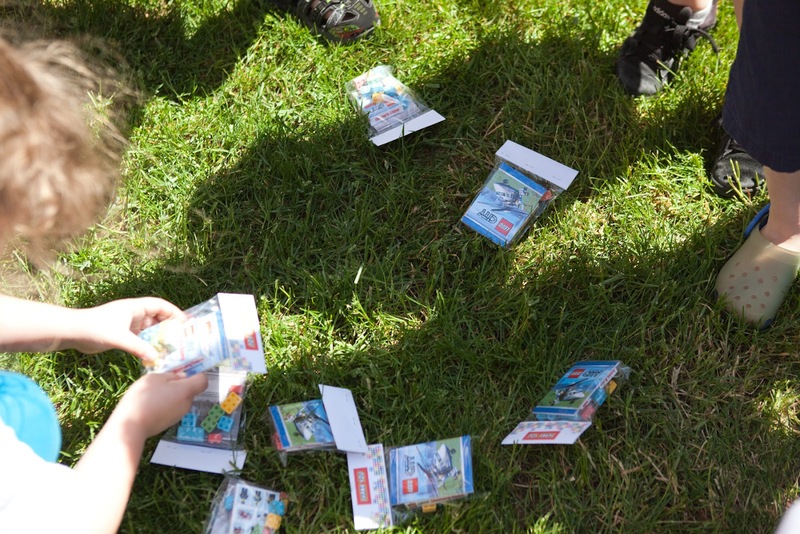 I should have known that the big bin of Legos would be more fun than an organized relay race! 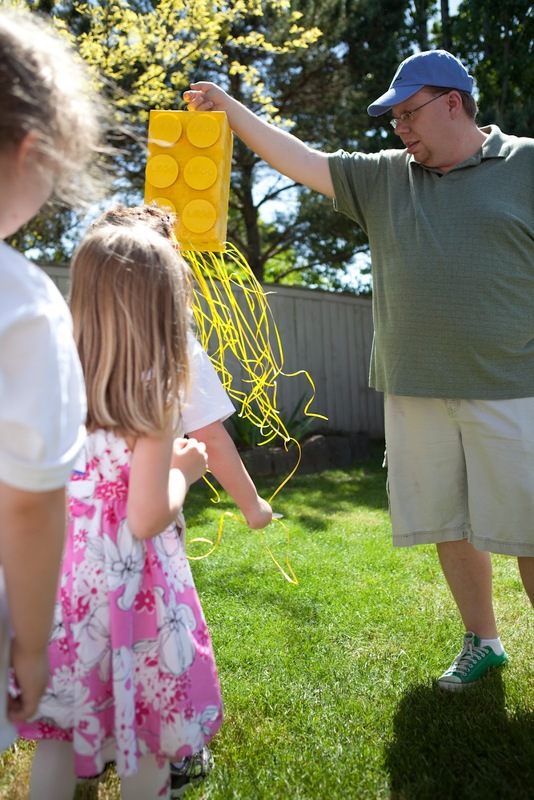 I let the kids play for a bit, and then we moved onto the pinata! Picture high pitched excited squeals and a raucous round of, "Pinaaaaaaata!!!!!" when the kids saw it come out. 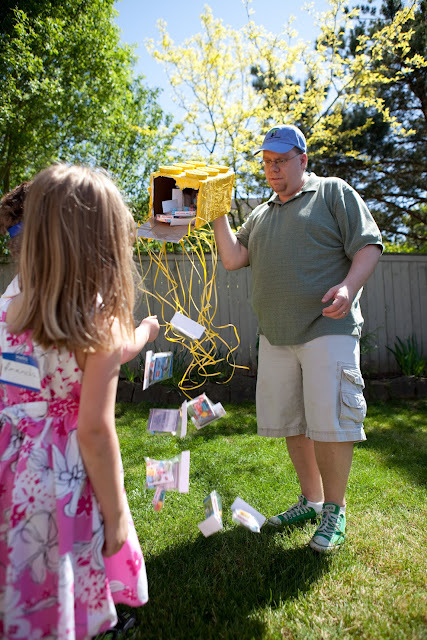 I opted for a pull string pinata because, well...I'm just leery of 5 year olds and sticks. Call me crazy. I followed the pinata tutorial From Delia Creates and it turned out great! Wow.SuperWow. My kids WILL have a Lego party, or I'll have to have one for myself! I really love the Lego Canvases. Looks like it was an amazing party! Nicely done! Love your ideas! 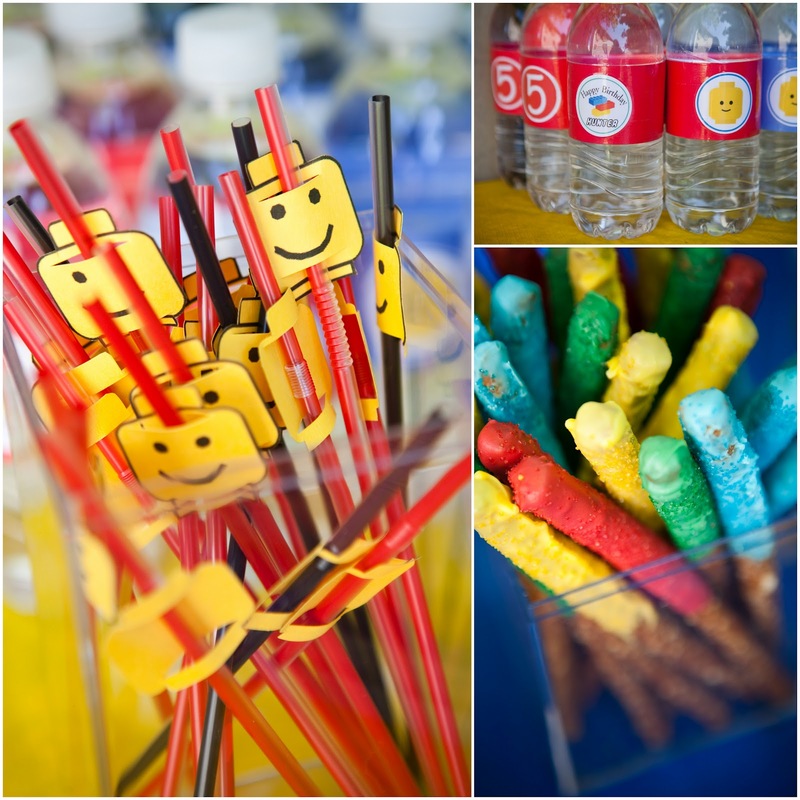 Wish I would have come across your site before we just held my son's 10th birthday this past weekend! Thought I'd share our party ... thanks for sharing all of your ideas! I am definately marking this site to save ... we've had Lego parties three years in a row and will probably have another next year! 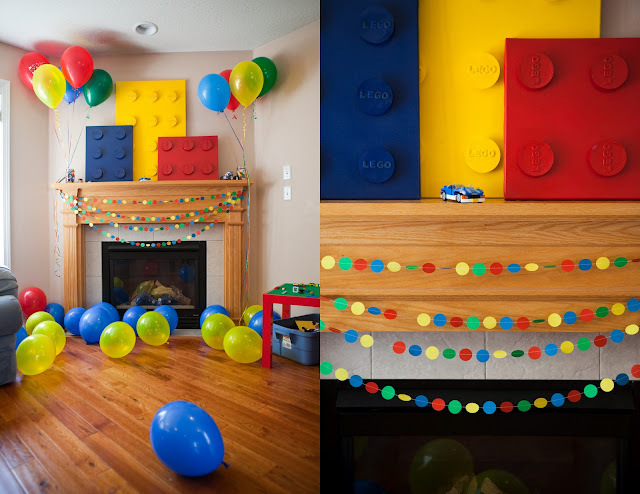 I've always put on big parties for my kids (I think I'm the only one in our circle who ever did), and go all-out like this. 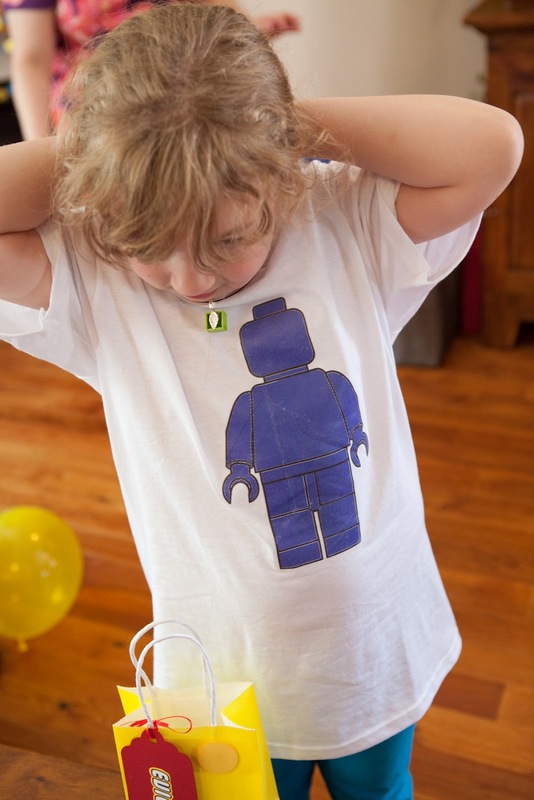 I am SO HAPPY to see you share your wonderful ideas & creations in such detail! Thank you for the new inspirations!